At 10:05 p.m. Paddock began his 10-minute deadly barrage into the crowd, firing off more than 1,000 rounds, police said. Police didn't arrive on the 32nd floor until 10:17 p.m., which is two minutes after he had stopped firing. 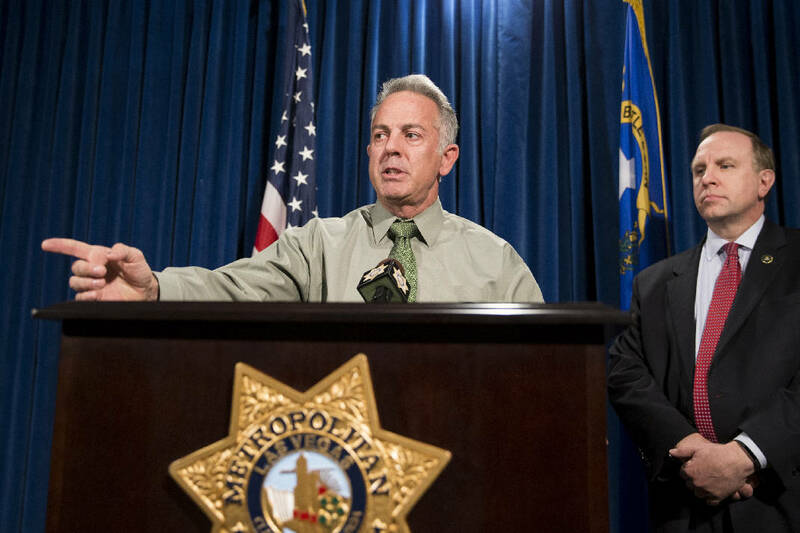 The sheriff had previously hailed Campos as a "hero" whose arrival in the hallway may have led Paddock to stop firing. On Monday, Lombardo said he didn't know what prompted Paddock to end the gunfire and take his own life. Campos had been dispatched to the 32nd floor before Schuck to respond to an alarm that signaled a door was open and heard an odd drilling sound, police have said. As he approached there was a series of single gunshots through the door, one of which hit him in the leg. At about the same time the maintenance worker arrived and Paddock fired more than 200 rounds through the door at Campos and Schuck. "We cannot be certain about the most recent timeline that has been communicated publically (sic), and we believe what is currently being expressed may not be accurate," said Debra DeShong, a spokeswoman for MGM Resorts International, which owns the Mandalay Bay hotel casino. The company's statement did not offer what it thinks was the correct timeline. "When you have law enforcement on property you defer to them," Tatonetti said, adding that hotel security officers would turn to their primary duty: guest safety. Officers would focus on evacuating and keeping guests away from dangerous areas. It was unclear if the hotel relayed the reports of the hallway shooting or the gunman's location to the police. The Las Vegas Metropolitan Police Department hasn't responded to questions from The Associated Press about whether hotel security or anyone else in the hotel called 911 to report the gunfire. Police have not responded to questions about the hotel's statement or whether investigators stand behind the revised timeline released earlier in the week. A request for the 911 recordings was denied by police who said they were part of the ongoing investigation.